But Ware sees the positive in his difficult schedule. Ware’s life experience is more the norm than the exception at Mitchell High School in Colorado Springs School District 11. Located east of The Citadel shopping center since opening in 1965, when the area was bustling with vitality, Mitchell, like other southeast-area schools, has struggled in tandem with southeast’s neighborhoods. Students are more likely than not to be considered economically disadvantaged, and many have parents who didn’t finish high school, let alone go to college. U.S. Census Bureau statistics show as low as 8 percent of adults living in parts of southeast Colorado Springs have a college degree. Poverty, along with difficult home lives and personal circumstances, the absence of electronic devices outside of school and a lack of emphasis on the importance of education can result in students trudging through their academic career with automatic strikes against them. They also tend to have more behavioral problems. Overall, about one in four students in southeast Colorado Springs middle and high schools were disciplined last school year. That compares to the statewide average of about one in 11 students. Altercations related to racial tensions and drug deals flare from time to time at southeast schools, including an incident in October 2016, in which a sixth-grade boy stabbed a classmate with a pencil. The incident led to a plea agreement in juvenile court and a civil lawsuit by the victim’s family, claiming bullying and racial slurs were involved. 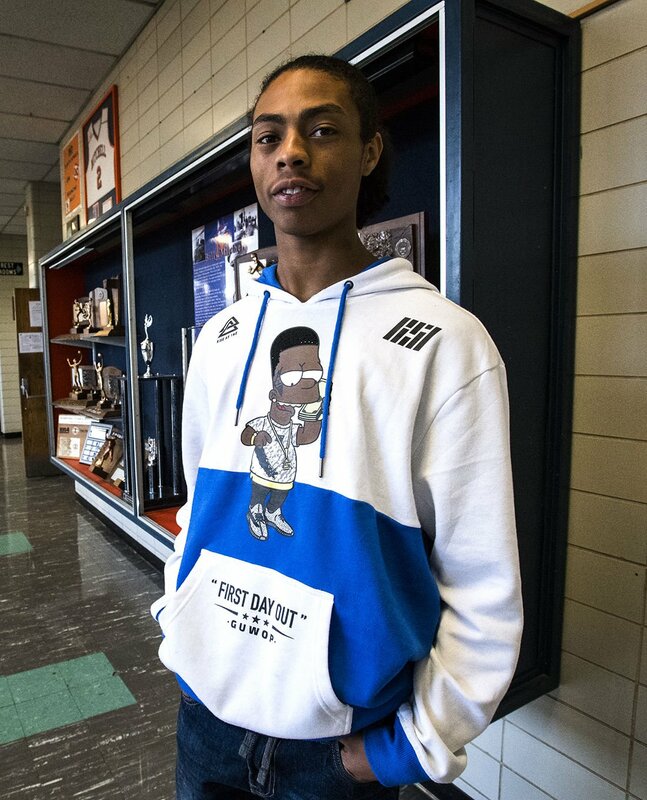 Being in the midst of high crime and gang activity, inner-city schools have taken on the role of safe haven, where children can feel nurtured and encouraged, not fearful and anxious, educators say. “One thing I think we do a really good job of is not highlighting it as a challenge, but as an opportunity,” said Andre Spencer, superintendent of Harrison D-2, the region’s most culturally, ethnically and economically diverse school district. Harrison D-2 comprises nearly all the schools in the southeast, except for Mitchell High and its feeder schools, which draw students from the southeast side. After decades of sub-standard achievement, Harrison has accomplished what seemed like the proverbial impossibility of moving a mountain. Several D-2 schools have improved academic performance enough to be recognized by the state and federal education agencies. And a few weeks ago came the announcement that both the 2018 Colorado Teacher of the Year and Counselor of the Year hailed from Harrison schools. Strategies that lead to success are sensible, say educators who have seen results. Personalize education for every student. Show interest in kids’ lives. Set high expectations. Praise strengths and strengthen weaknesses. Many underprivileged youngsters start kindergarten already behind, not being familiar with letters or counting. Laird’s school started an exchange program for students to take home books to read and explored the city during school-day field trips. Schools in poor neighborhoods have to be more than classrooms, more than a place where students are taught for seven hours and then sent home. 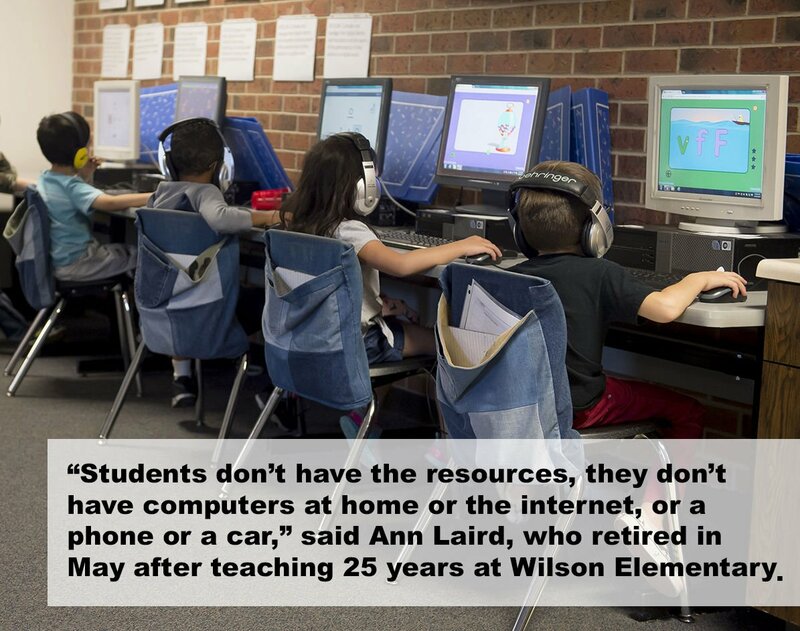 When basic necessities are not being met at home, schools are stepping in. 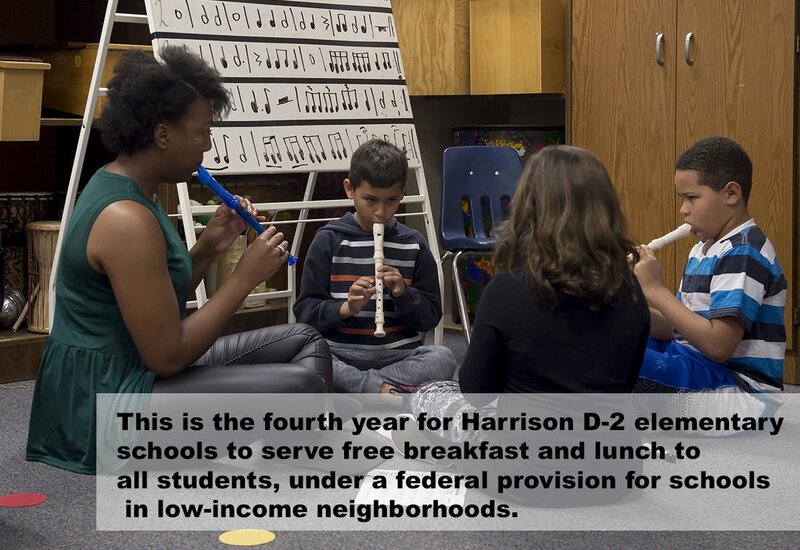 Poverty among Harrison D-2 students continues to climb, from 65 percent of qualifying for free and reduced meals in 2007 to 76 percent last year districtwide — one of the highest percentages along the Front Range, according to state education statistics. This is the fourth school year for D-2 schools to serve free breakfast and lunch to all students, under a federal provision for schools located in low-income neighborhoods. The program has made a “huge difference,” said Wendy Godwin, principal of Wildflower Elementary, which in September won a National Blue Ribbon Award for ranking in the top 15 percent of all Colorado elementary schools on state assessments for multiple years. Wildflower’s poverty enrollment jumped from 70 percent of students qualifying for free and reduced lunch rates last year to 84 percent this year, Godwin said. “We are in a lower socioeconomic area, and the needs of the community have increased,” she said. The needs vary by school. Some schools work with agencies such as Care and Share Food Bank to give students food they can take home for their families. A few schools have an on-site health center. Two D-2 elementary schools have switched to a year-round calendar, which has helped with child care and students’ retaining information over the summer. Godwin said staff members are “constantly reaching out” to parents, she said, to figure out how they can help, from free dinner and discussion nights to free tutoring and free club memberships. “If we can get better support from our parents they’re going to return that by better supporting their students,” she said. Students say they’re proud of Mitchell, like what it offers in the way of education and extracurricular activities, but it continues to have a stigma. The topic comes up at sports events and other competitions, and even in normal conversation, said junior Rosa Henson. Rosa ticks off Mitchell’s vast performing arts offerings and having the largest ROTC west of the Mississippi, automotive and construction trades programs and athletics. But there’s still plenty of work ahead. Mitchell High School’s class of 2016 saw the lowest graduation rate among high schools in the southeast, at 72.4 percent, compared with about 79 percent statewide. Mitchell also had the highest dropout rate last year, at 2.6 percent, slightly higher than the state average of 2.3 percent. Pikes Peak United Way, in partnership with the University of Colorado at Colorado Springs, selected Mitchell in the spring for a pilot program, Colorado Springs Promise, to help improve its graduation rates. Mentoring students, providing free refurbished computers, conducting fundraisers to pay college application fees, coaching students on interview skills and other assistance is being offered to help motivate students to stay in school and go to college. Districtwide, Harrison D-2 has posted higher graduation rates and lower dropout rates than state averages since 2013. But it’s been declining: D-2’s graduation rate decreased from 88 percent in 2013 to about 80 percent in 2016. Still, the rate is much better than 2010, when only 67 percent of D-2 students graduated, according to state figures. “We want people to recognize that these are just kids like in any other district, whether they’re affluent or not, and we’re here to give them the best education they can possibly receive,” Wildflower’s Godwin said. That’s precisely how students at Mitchell High feel. If a tornado uprooted Mitchell and plunked it down in a more affluent neighborhood, senior Noah Cisna believes it would have a much different image. Many students lead difficult lives, she said. 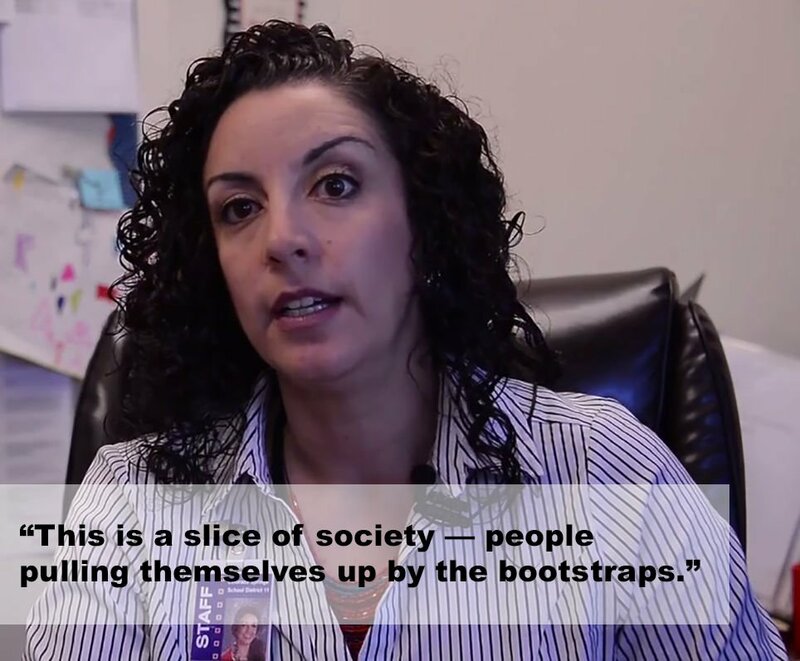 “Whether it’s poverty or they’re homeless or they’re adults as children, having to raise younger siblings, that contributes to the grit that young adults need to be competitive and for society to sustain itself,” Sanchez-Martinez said. Student body president Jonathan Pena said he was bullied at his previous school and didn’t make many friends. Among high schools in the southeast section of town, Mitchell had the lowest percentage of students disciplined last school year — 21 percent. Spencer, Harrison D-2’s superintendent, agrees that it’s challenging to overcome the negative image of the southeast area of town. Burt Hubbard contributed to this story.